A lower-cost alternative to bolted hangers, the THGQ and THGQH hangers for multi-ply girder trusses use Strong-Drive® SDS Heavy-Duty Connector screws to provide high load capacities and easier installation compared to bolts. The Strong-Drive SDS Heavy-Duty Connector screws help transfer the load between the plies of the supporting girder when they penetrate all plies. THGQ and THGQH models offer minimum and optional maximum fastener quantities to accommodate varying design needs. Allowable loads for various girder web member sizes provide additional installation options. The HTHGQ is a high-load version designed to carry multi-ply trusses or composite lumber up to 5-ply girder trusses. For high load capacities and easier installation compared to bolts, the HTHGQ is designed for use with Strong-Drive SDS Heavy-Duty Connector screws. Strong-Drive SDS Heavy-Duty Connector screws supplied for all round and triangle holes. Installation may not require use of all Strong-Drive SDS Heavy-Duty Connector screws. All multiple members must be fastened together to act as a single unit. The thickness of the supporting girder must be equal to or greater than the screw length. For applications where the length of the supplied screws exceeds the thickness of the supporting girder, 3" or 4 1/2" screws may be substituted for the longer length screws with no load reduction, or a shim block may be used as approved by the Designer. Girders must be adequately laterally braced to prevent excessive displacement due to secondary torsional stresses (Ref ANSI/TPI 1-2014 Section 7.5.3.5). THGQH may be skewed 45° for the models shown. For hem-fir or spruce-pine-fir members, multiply tabulated allowable loads for the skewed THGQH by 0.86. Connector must be installed centered on girder vertical webs. Connector must be installed centered on girder vertical webs. Strong-Drive® SDS Heavy-Duty Connector screws that penetrate all plies of the supporting girder (screws must penetrate a minimum of 1" into the last truss ply) may also be used to transfer the load through all the plies of the supporting girder. When SDS Heavy-Duty Connector screws do not penetrate all plies of the supporting girder truss, supplemental SDS screws at the hanger locations may be required to transfer the load to the truss plies not penetrated by the face fasteners, as determined by the Designer. The supporting girder truss must have adequate thickness to accommodate the screw length, so that the screw does not protrude out the back of the girder. 3"- or 4 1/2"-long Strong-Drive® SDS Heavy-Duty Connector screws may be substituted for longer SDS screws with no load reduction. 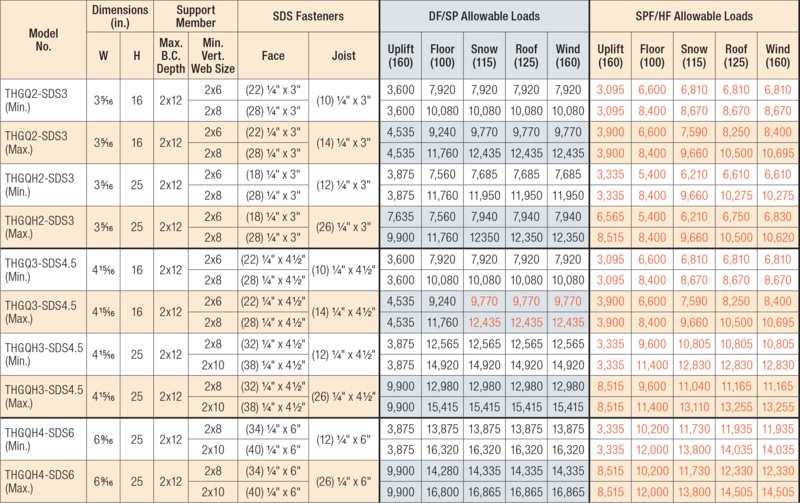 For installations to LSL, use 1/4" x 3" Strong-Drive® SDS Heavy-Duty Connector screws and use the DF/SP table loads. Tabulated allowable loads must be selected based on duration of load as permitted by the applicable building code. Connector must be installed centered on a minimum 2x10 vertical web. A minimum three-ply carrying member is required for the tabulated loads. Carrying truss plies must be adequately fastened together as determined by the Designer. HTHGQ2-SDS No evaluation report listing. HTHGQ3-SDS No evaluation report listing. HTHGQ4-SDS No evaluation report listing. HTHGQ5-SDS No evaluation report listing. THGQ See specific model numbers for code listings. THGQ2 No evaluation report listing. THGQ3 No evaluation report listing. THGQ3-SDS4.5 No evaluation report listing. THGQ3.62-SDS3 No evaluation report listing. THGQ5.50-SDS4.5 No evaluation report listing. THGQH See specific model numbers for code listings. THGQH2 No evaluation report listing. THGQH3 No evaluation report listing. THGQH3-SDS4.5 No evaluation report listing. THGQH3.62-SDS3 No evaluation report listing. THGQH5.50-SDS4.5 No evaluation report listing. THGQH7.25-SDS6 No evaluation report listing.